2) that there is such a thing as an airing cupboard. I’m guessing you don’t have airing cupboards. I have been to Texas but I cannot remember seeing any. 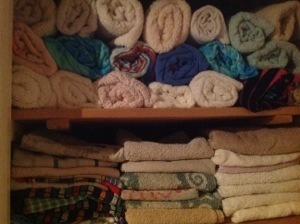 You can still store your towels like this it really works. What would be the Dutch equivalent of an airing cupboard? But is it the same? If so, why “airing”? Our airing cupboard has a hot tank in it which makes it warm and dry. Ideal for airing or drying off clothes. Oh! We have nothing that fancy! The closest we have to that is a dryer, I suppose.